By day, TCGers develop complex applications and web tools that helps government address socio-economic issues and serve communities nationwide. By night (and sometimes on the weekends), TCGers basically do the same thing. 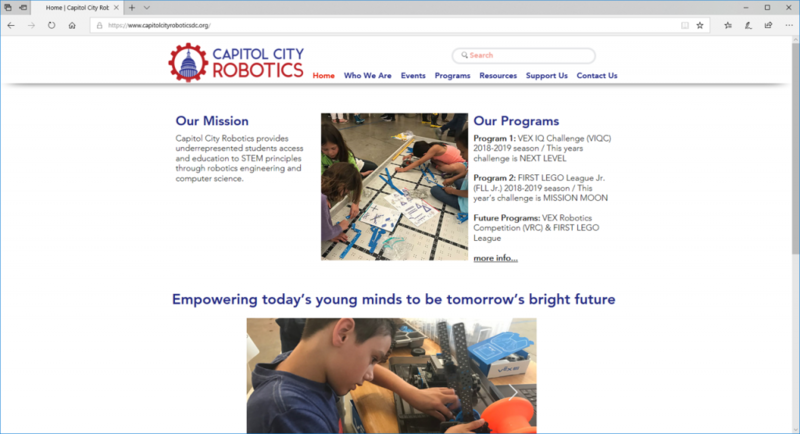 For the past several months, a group of TCGers have been helping a local organization called Capitol City Robotics build their website. Capitol City Robotics helps underrepresented and underprivileged youth in D.C. gain access to STEM education through robotics engineering and computer science activities. The nonprofit organization holds a number of fun Lego and VEX IQ competitions for students in an effort to inspire future generations to pursue STEM careers. The goal of the project was to create an accessible website that could be easily maintained by Capitol City Robotics after it was launched. The TCG team handed the maintenance of the site over to Capitol City Robotics in late October. Although the TCGers are standing by for questions, their support of the Capitol City Robotics website is now over, and they must watch their project take flight. To check out the fruits of the TCGers labor of love, and to find more information about Capitol City Robotics, check out their website here.